Project Update and request for opinions! And now my plea for your opinions. I thought I wanted short sleeves, but when I finished the first one, I really didn’t like it. I’m thinking 3/4 length sleeves so it feels more sweater-like. BUT..I can’t decide how to finish the cuffs. a) Match the current border of the sweater? b) Try garter stitch again? c) Do a 1×1 rib? d) Insert your idea here! Thank you so much and spin on! This entry was posted in art yarn, knitting, Spinning and tagged art yarn, handspun, knitting, Spinning by Leah. Bookmark the permalink. When I recently finished my featherweight cardigan with half sleeves I did garter like I had around the edge of the body, and it flared horribly. I decreased the last round of knit with 8 stitches (lace yarn), but it still looked big and weird in garter. So I ended up doing seed stitch which didn’t look too different from the other edge at least in my yarn and colour. Still with the 8 st. decrease. Garter just takes up a lot more space compared to stockinette. I think the lacy part of your sweater would be too much for the sleeves for me at least. But if you like it, it would not look silly, it’s just my personal thing. Thx! My husband said the same thing about the lace part! I like the seed stitch thought..the flare on the garter did bug me. Super appreciate you weighing in! I like the idea of the 3/4 length sleeve. And I like the idea of echoing the lace on the hem on the sleeves. 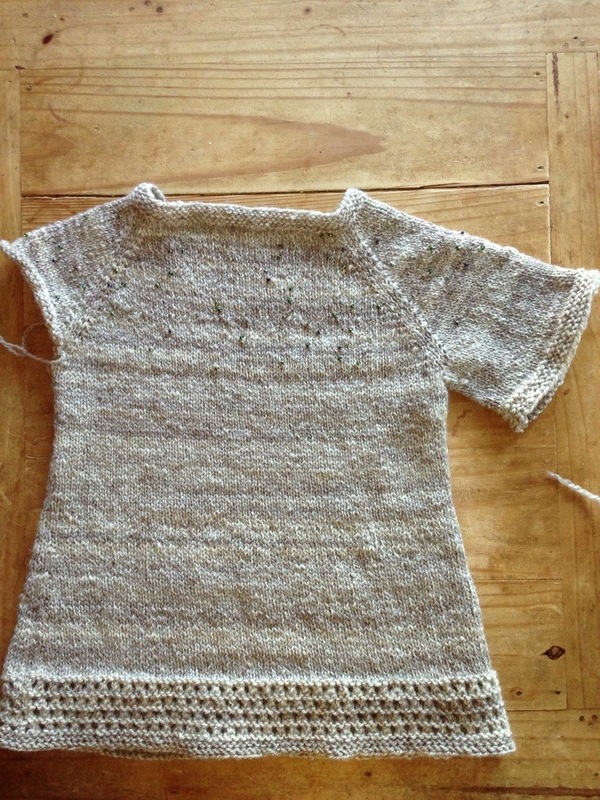 What about knitting a lace edging that you then fold up and fasten with an attractive button? Oooh…that is intriguing!!!! I like that idea! Or if you do want lace, make it just 2 rows of holes instead of 4? I agree with the other two in favor of 3/4 length sleeves with the lace edging. I am really leaning to that option too!! Thanks for your thoughts and for stopping by the blog! Thanks!! That means a lot coming from someone who is a great designer!! Thanks!!! Don’t give up on the spinning! Once it clicks it’s really amazing!